Created by crosses between Siamese, Abyssinian and American shorthairs, this spotted feline may look like a fierce little leopard, but under the spots the ocicat is pure pussycat. The ocicat was developed in 1964 by accident, when Siamese breeder Virginia Daly, of Michigan, crossed a seal point Siamese female with a ruddy Abyssinian male in the hopes of developing an Abyssinian-pointed Siamese. The first litter of kittens all looked like their Abyssinian father, since the Abyssinian pattern and coloration are dominant over the Siamese pattern and colors. Next, Daly bred one of the female half-Aby, half-Siamese kittens to a chocolate point Siamese male. The resulting litter gave her the Aby-pointed Siamese she was trying to achieve. However, the litter also contained an ivory male with golden spots and striking copper eyes, which Daly named “Tonga.” Daly’s daughter dubbed him an ocicat because of his resemblance to a baby ocelot (an American wildcat). Daly began an ocicat breeding program using Abyssinians and Siamese, and worked to turn this happy accident into a recognized breed. Later, American shorthairs were added to introduce the color silver and give the breed a larger, more muscular body. The Cat Fanciers’ Association (CFA) and The International Cat Association (TICA) both accepted the ocicat for championship competition in 1987. All North American associations now recognize the breed. In 1986, the gene pool was closed to Siamese and American shorthair outcrosses. 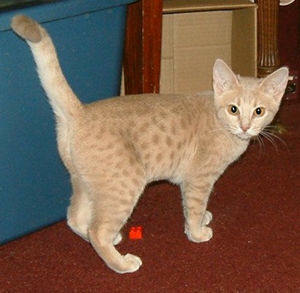 However, Abyssinians are still used in ocicat breeding programs and will be until January 1, 2005. This will help keep the gene pool large and healthy. The breed is large, athletic and long-bodied with substantial bone structure and muscle development, exuding power and grace. The legs are long and muscular, the torso solid and hard, and the cat has surprising weight for his/her size. Combined with a loose-shouldered hunter-like stride and vivid eyes that gleam with intelligence and cunning, this breed reminds you that our domestic felines were wildcats only a few thousand years ago. The coat is short and glossy, and show quality ocicats possess round or thumbprint-shaped spots that come in 12 colors, including tawny, chocolate, cinnamon, blue, lavender, fawn and six shades of silver. The spotting pattern is distinctly different from the other four spotted breeds: the Egyptian mau, Bengal, California spangled and pixie bob. The spots are arranged in a bull’s-eye pattern, courtesy of the classic tabby pattern from which the spotted pattern originated. Too, the ocicat is an agouti or “ticked” breed, courtesy of her Abyssinian ancestors; look closely and you’ll see that each hair is decorated with bands of alternating color, ending with a dark tip. The forehead bears the classic tabby “M.” All eye colors are allowed except blue. Other patterns such as classic, mackerel and ticked tabby are also produced in most ocicat breeding programs, but ocicats without spots are not show quality and are usually sold as pets. Ocicats are active, curious and athletic, and have a highly honed hunting instinct. Like their Abyssinian and Siamese ancestors, ocicats are energetic and talkative and are perfect for those who like playful, lively, interactive cats. They’re people-oriented and affectionate, too, and display a strong devotion to their human companions. Like their Siamese ancestors, ocicats can be quite vocal when something is frightfully wrong like empty food dishes, but they aren’t as loud or annoying as their Siamese predecessors. Highly intelligent, ocicats thoroughly know their names and can be taught a variety of tricks usually reserved for the canine crowd, including coming on command and playing fetch. In fact, some owners claim their ocicats are too clever. Prospective owners should be aware that ocicats have a talent for mischief and can be hard on fragile household items. Not even the highest shelf is out of reach for the athletic ocicat. These are not good pets for folks who like couch potato cats. Like the Siamese, ocicats are very dependent on their human companions and need human interaction. If you work all day and play all night, another breed would be a better choice. However, if they are provided with a cat companion, ocicats can do quite well while waiting for you to come home from work. Just remember that two ocicats can get into twice as much mischief as one.